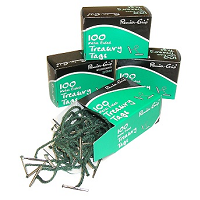 Treasury tags, or India tags, are stationery items which consist of a short piece of cotton cord, with either metal or plastic bars at each end. Treasury tags of different lengths are designed for paper of different quantities or thickness. Choose a tag long enough to accommodate the width of the documents but not so long as to allow the paper to become sprawled out and untidy. 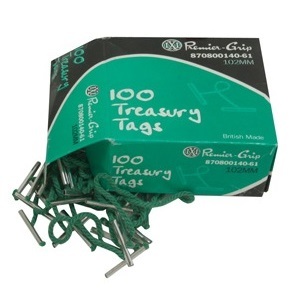 We only supply the original, traditional Premier-Grip® treasury tags, British Made for the past 100 years. Beware of cheap, inferior imitations; Buy the best, buy the original. The traditional method of holding punched papers and computer listing paper together. Manufactured from green cotton cord with 23 mm white plastic tags. Premier-Grip® - the original brand - British Made for the past 100 years. 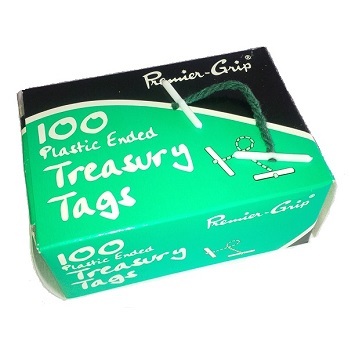 Box of 100 plastic ended treasury tags. Manufactured from green cotton cord with 23 mm tinned steel tags. Box of 100 metal ended treasury tags.